Everyone starts somewhere down their spiritual path. You attend a ritual or a blot or do your own personal ritual as you experiment with your spirituality. Maybe you were interested in exploring your spirituality due to reading books on myths growing up (like me) or something in an alternative spiritual path called to you. In books or online, you can find rituals to perform. I share my rituals and blots here to help people get started on their own paths by giving them something to use or to inspire them to write their own. Once people get settled into a spiritual path that involves gods, ancestors, or beings like nature spirits, people tend to start with their own little prayers—even from something as simple as gratitude for a god or goddess’s presence in your life to thanking the deity (“Thanks, Odin!” or “Thanks for giving me confidence in dealing with that, Cerridwen!”) to something with more details to asking them for help with something and then thanking them for what you believe they helped you out with. To help you as you start a pagan path to connect with said beings is to create your own prayers. Prayers that come from your heart, head, and mouth have more potency than one written by someone else’s prayers, but we all have to start somewhere. Both rituals and blots, as well as prayers, are based around the concept of sacrifice and do ut des, or the idea of gifting. We give to the gods some of our creations of things we’ve made from baked goods to poems to drawings, energy that we’ve imbued into the sacrifice of drink, bread, or other offerings, or our words through our rituals and prayers. The more it comes from your own work (written, drawn, created, or grown), the more empowered the offering. In prayer, we are giving our thoughts and energy towards the entity we are praying to, whether it be deities, landvaettir/nature spirits, or ancestors. One way to think of it in a simplified manner is when a friend reaches out to you just to say hi. It does warm the heart and that little bit of attention can make a difference. Same with the entities you are praying to–it gives them a little bit of energy, personal mana, or megin as described in Norse heathenry. It might take a minute or so out of your day to say a prayer to the entities you want to work with, but it does help establish that connection and strengthen it the more you do it. We give so that we may receive. A healthy relationship with family, friends, the gods and goddesses we feel connected to, the ancestors, and the land spirits is one where each side gives and receives from the other. It can be a simple thanking of a tree or the spirit within as you relax on a beautiful day for the shelter it provides. There are many different reasons people have to pray which feeds into how you might create a prayer for yourself. Some are creating a prayer as a way of thanking the gods or a praising a particular entity, while some are choosing to request a blessing of some sort before something they feel they need to request aid for, while others feel that they might need some protection while dealing with something stressful or before doing magical work, and then some are asking for help from the beings they are creating a prayer for. And some will say a prayer for the same reason someone might pick up the phone—just to say hello and to connect with them in conversation. One thing to take into consideration if you are asking for help is are you requesting help or are you demanding help because of the urgency? Taking these points into consideration (the who, the why, and the what do you want from the prayer) will help you get prepared for writing your own. Keep in mind that the deities, ancestors, and land spirits are not vending machines (as many people writing about prayers and offerings will mention)—you need to establish connections with the entity you want to work with. Many people make a prayer for a god or goddess to help them with something, and if things go well, they say they will make offerings for them at every ritual or blot for a year or something similar as a thanks for helping them out. What I’m going to do is let the reader follow as I create five prayers—three for the deities I work with, one for the nature spirits/landvaettir, and one for the ancestors. The three deities I primarily work with are the Norse goddess Freyja, the Welsh goddess Cerridwen, and the Celtic god Cernunnos. This step takes either you being very familiar with the entity you want to work with or a bunch of research. You aren’t just researching the entity you want to work with, but also the cultural context of said entity. For example, working with ancestors in an Irish context where the idea of the ancestors sailing to the west or the sea being tied to them versus working with the ancestors from a Norse approach where there might be halls and locations they are in such as Helheim, Folkvangr, or Valhalla depending upon how they died or who you are trying to reach. One thing to be aware of is that various gods and goddesses have more than one aspect they are known for. For example, Freyja is known for magic, for love, and for fertility. Cernunnos is known for being a god of the wild, life, and as a walker between worlds. So, if I wanted to write a prayer to a certain aspect of Freyja, for example to help me with my magical work, I would try and call upon kennings that reflect her connection to magic, rather than her connection to love or fertility. If I wanted to call on Cernunnos to help me develop a stronger connection to nature, I would describe those titles and things he’s known for that are tied into nature, rather than the Underworld. At the same token, if you are connected to a god or goddess, you don’t only have to call on them for what they are known for. For example, while Aphrodite is known as the goddess of love and if you have a connection to her, you can reach out to her to continue building your relationship with her on the subject of money, courage before a big presentation, or other similar things. The god or goddess you’ve created a connection with just might be able to help you with the request that normally doesn’t fit their purview. It’s better to turn to a god or goddess you do know and have a relationship with, than to turn to one you’ve never really worked with if you need assistance. For Freyja, I want to work on developing a better understanding and connection to magic, so I’ll choose kennings based that aspect of her myths and what she’s known for. For Cernunnos, I want to work on being better connected to nature and the liminal aspects of our world and that of the Otherworld. For Cerridwen, I want her help with getting better attuned with my own wisdom (the Awen) and transforming myself into someone who can better work with the deities, ancestors, and nature spirits. For ancestors, I’d like to thank them for their presence and for those who came before me and ask them to help me better hear, understand, and work with them so I may become a better priest. For the nature spirits, I want to just be better connected with them, thank them for being patient as I learn to better understand them and their ways. If you were specific about your word choice for the kennings part, the things you’d want to tell the gods, goddesses, and other entities about why you are praying to them, should fall into place. Since this is your personal prayer, here’s where people might put in their own personal experiences that they’ve had with an entity that falls into the unverified personal gnosis category for what your work with a being might have taught you. Some might only have a line or two or three for why the person praying is calling specifically upon said entities. For this, I’ll write three for each to give more examples of what I might say. Also, some find that some form of repetition adds power to your words. Rhyming also can make it easier to remember which gives you more freedom to imbue your words with more oomph. Right now, I’m putting down a rough “why I’m calling out to you” reason. Some might be more polished than others and end up the same in the prayer, but some listed below might be reworked to have a strong element of poetry added. Putting in the time and effort into the creation of your poem is something that many have said the gods can notice. What goes into this section of your prayer are why you are asking them, of all the possible gods, goddesses, or other beings you are reaching out to them. Praise or thanking prayers are easier along this front and you can use a lot of images of their generosity or praise. In request-based prayers, what you chose for your kennings will be reflected and clarified in here, so some repetition will happen. For Freyja as I said above, I want to work on developing a better understanding and connection to magic and the magic that surrounds me. I also want to add praise in there because I’m not asking for a direct act, but for her influence on my life. For Cernunnos as I mentioned, I want to work on being better connected to nature and much like hedge witches being able to sense the liminal aspects between the realm of humans and the Otherworld. For ancestors, I’d like to thank them for their presence and for those who came before me and ask them to help me figure out how to work better with them and connect with them. For the nature spirits, I want to just be better connected with them and thank them for being patient as I learn to better understand as well as connect with them and their ways. Here is where you ask for what you want. If you are familiar with stories of people making wishes (as in famous story of the Monkey’s Paw) or the old saying “be careful what you wish for,” it can apply here if you are asking for something. If you are just thanking them for their presence in your life, what usually happens is that you will start sensing them more and more in your life as you attune yourself to them and they notice you being appreciative of their continued presence. For Freyja, I want to request better understanding of magic and being more in tune with the magical ways of the world. For Cernunnos as I mentioned, I want to work on being better connected to nature and being better able to sense the different worlds out there. For Cerridwen, I want her help with being more in tune with her creation of the Awen and helping me transform my life into one that’s more in line with her knowledge and myths. Once you’ve got the main three sections, you could just take what you’ve written and put it together if you feel strongly enough about how you wrote things down. Chances are, you’ll want to play around with how it sounds and flows, especially for certain entities. For example, the Fair Folk are known to appreciate rhymes and word play, so making sure a prayer to them sounds more like a poem might have a better chance of catching their attention. For a goddess like Cerridwen from who inspiration in the form of Awen flows from, making my prayer to her sound like a poem might help bring further inspiration my way. To end a prayer, I recommend making sure to add a thank you to the god or goddess, ancestors, or land spirits. I thank you for being a presence in my life now and in the future. As I travel through your realms. For Cerridwen, I want to make it feel more like a poem with rhyming and imagery that’s important to her such as her cauldron and her myths. I’m choosing to use internal rhyming and other such poetic techniques to draw attention to the lines I feel I want to emphasize in the prayer. I’m putting in the work into how the prayer flows to show her the work I plan to put into my request for guidance to demonstrate my working towards the goal even within the prayer. For the Ancestors, I choose to keep this prayer more straightforward and direct without much embellishment. To the nature spirits, who include spirits of nature as well as the faeries that inhabit our realm and their own who might visit from time to time, I want to have my prayer be respectful, but also playful in design. I want to be able to say it to respect an ancient tree on my property as well as say it to the wild, liminal places where they dwell. I’m also choosing to give it more of an Irish feel by referencing how the Irish viewed their cosmos—in sea, land, and sky. To falling rain and winds unknown. I ask of you, please, to heed this prayer. And live among trees, and all that grows. To those that whisper among their leaves. I beg of you to guide my hand. I pray you’ll help me when you’re near. If you’ve followed my steps and created your own prayers, you’ll want to start working with them. One thing I recommend is lighting a candle for when you say your prayers, especially to the gods and goddesses. In so many mythologies, fire was a power of the gods that we came to possess usually through a gift that we were not supposed to have. Fire is viewed as a conduit to the gods, so using it to help send your prayers up can help get your words to them. Another thing that I’ve noticed people might not think about is how to say them. Christians tend to put their hands together in the classic prayer stance, but from what I’ve read and from my old Wiccan training, there’s a stance known as “orans” which is standing with your elbows bent (from a slight bend to an almost 120º bend), palms open and facing upwards or outwards as if to both give and receive at the same time. The image at the top of the post is one way to hold your hands in the orans position. 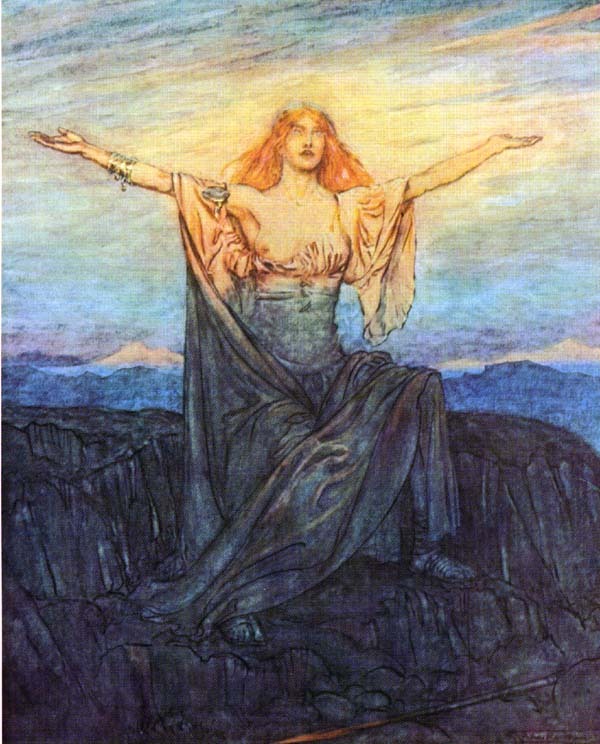 Some hold their hands down closer to their waist, while some hold their hands out in front of them as if someone was about to hand them something long to hold, and some hold their hands up and out like the image above by Arthur Rackham of Brünnhilde waking up to greet the day and Siegfried from Wagner’s Ring Cycle. Find what feels the most comfortable to you as far as how you choose to stand. The orans position is usually commonplace in pagan groups because it is also a stance which opens you up to the energies of the work happening, whether it be public ritual or private prayer. It’s a receptive way to hold yourself. Also give it a try in any ritual work you choose to do and see if you notice a difference. If it works for you, go with it. If it doesn’t, find a stance that does. Do what’s right for you and what you want to accomplish. Also, you can try taking your prayer and coming up with a short sentence to summarize what your prayer is about so it can be used as a quick prayer as you start to undertake something that you’ve asked their help in or as a mantra to focus your attention to connecting your mind to the longer form of the prayer. For example, for Freya, I would say “Freyja, help me attune myself to the nature of magic” before I start a ritual or something of a magical nature. For Cernunnos, I would say “Cernunnos, help me connect better with nature” as I walk through a forest. 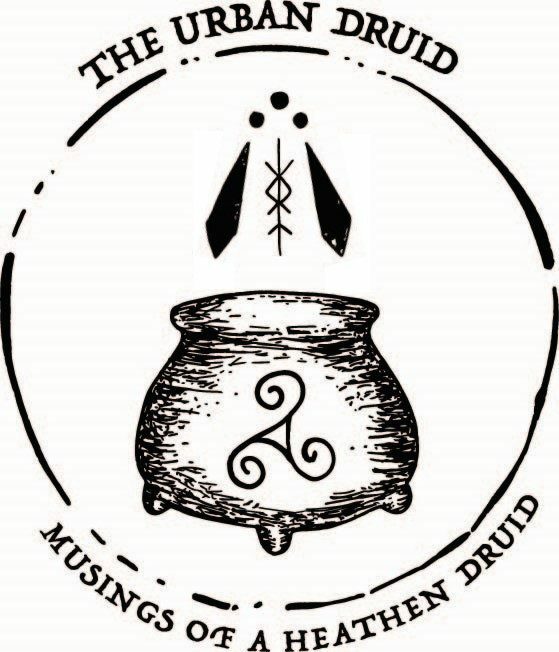 For Cerridwen, I would say “Cerridwen, help me become my own cauldron for transformation and growth in wisdom and Awen” as I start magical studies or clergy work so I can learn and grow as I work, write, and read. For the Ancestors, I would say “Honored dead, help me better understand and help you as I best can” as I walk through a graveyard or when doing something that is a life path or something you know previous generations of yours have done. NOTE: I choose the phrase “honored dead” as a way to call out to ancestors who mean me no ill will as compared to those who might be more malicious or mischievous. For the land spirits and faeries, I would say “Spirits of sea, sky, and land, help me learn your ways to understand” as I walk in more wild areas so that I can become more attuned to them and their ways as well just better sense them and their spirits in the trees and land around me. I hope this guide helps you in your own work. If one of my prayers is pitch perfect for you, feel free to use it. If you have thoughts you’d like to share about your own work creating prayers or share prayers you’ve written, please feel free to share your own work with me as well.